KITS INCLUDE PATTERN. FOR DRESS ONLY, THE PATTERN COST WILL BE DEDUCTED. The dress is made with an ultra-suede light bodice and a skirt from gathered 1/2" wide knitting ribbon sewed to a batiste underskirt . 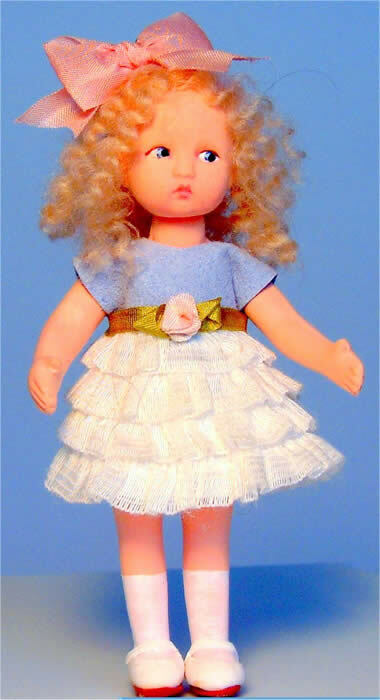 Her narrow ribbon sash is accented by a rosebud, and a pink ribbon in her hair echoes the one worn by Little Lou. Click on image to see her with Little Lou.